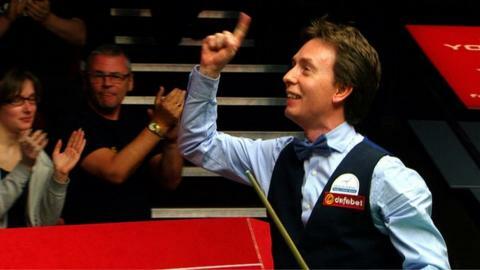 Ken Doherty progressed to the World Snooker Championship second round for the first time in eight years with a 10-5 victory over Stuart Bingham. Doherty, the 1997 champion, is the oldest man in the draw at 44 and had needed to battle through qualifying to arrive at the Crucible. But the Irishman rolled back the years as he won all six frames in the early session on Sunday to clinch victory. He said: "It was magnificent. It's a fantastic feeling to get through." Trailing 5-4 at the start of the session, Doherty made breaks of 55, 60, 57 and 60 to see off an out-of-sorts Bingham. Having kissed the carpet when he arrived in the auditorium at the start of the match, there was no doubting the Irishman's passion for the tournament. He said: "I was starting to get really emotional. When I went 9-5 up, I started to feel the nerves a little bit but I was loving every minute. "I don't know how many more times I'm going to be here again. I have to savour every moment. "I've had a lot of special memories out there and they came flooding back." Bingham added: "Ken did a number on me. He's 'Crafty Ken' for a reason - he can see your weaknesses and exploit them."